Quick installation, greatly reducing the time of road works. Significantly lower installation requirements than usual. Cost savings during storage and transportation. No accident hazard: the cover can be aligned, therefore pedestrians do not stumble all over the pavement. A common feature of underground distribution devices is the plastic shaft that houses them, the material of which is 100% recyclable polycarbonate. This provides excellent climatic conditions for electric equipment. The most important features are: aligning height and slope to the pavement level, short installation time (load can be applied within 1 day), lightweight design and mobility, plannable pipe layout, modular construction. 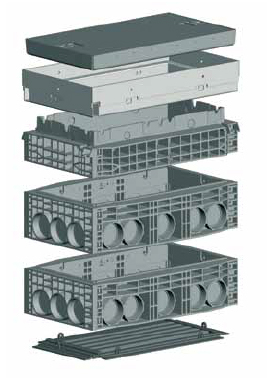 The modular construction results not only in a wide assortment, but also provides a high degree of flexibility during installation and assembly. The water that gets inside the shaft is led away into the soil via drainpipes. The heavily finned surface ensures a strong soil connection. The 40-ton load-bearing capacity makes it possible to install the shaft in public roads. In practice, load-bearing capacity depends on the cover, so in case of pavements of automobile parking lots, often only the 12.5-ton version is used. There are special versions available for tunnels, in accordance with the stringent fire resistance and safety requirements. Basically, the shaft is used for cable pulling and as a telecommunications circuit breaker installation. Apart from the electric power supplier references, it also has network permits issued by the public road management company, by the railway company and by T-Com. The necessary installation technologies are available to us. Further unique dimensions are possible on request. The height of the shaft and the pipe connections can be adjusted as a combination of frame elements.